Ragan Gennusa grew up in East Texas enjoying the outdoors and sports, but he was drawn to art and could always be found using his pencils and brushes when he had an opportunity. “Art was just something I always enjoyed,” he recalls. Gennusa took art classes in high school, along with being an All-State quarterback, and accepted a football scholarship to the University of Texas where he played wide receiver and majored in art. Gennusa credits his training as an athlete for teaching him to value courage, tenacity, and the importance of character in pursuit of life as well as an artistic career. After college, Gennusa worked as an artist for an Austin printing company, then as a staff artist for the Texas Parks and Wildlife Department. His talent was quickly recognized, and he was eventually promoted to art department supervisor. Although he enjoyed his job at the department, the day-to-day administrative work took its toll, and he left to paint exclusively for an Austin art gallery. This decision was a turning point in Gennusa’s career. Gallery work allowed Gennusa to develop his art. During this time, he became involved with the Gulf Coast Conservation Association, Ducks Unlimited, and other similar groups. “I’ve been fortunate to meet a lot of people in the sporting arena who liked my art,” says Gennusa. The artist now has a thriving career painting the great outdoors and its endless sporting images; his many commissions to paint animals or the Western landscape are sought by people throughout the United States. 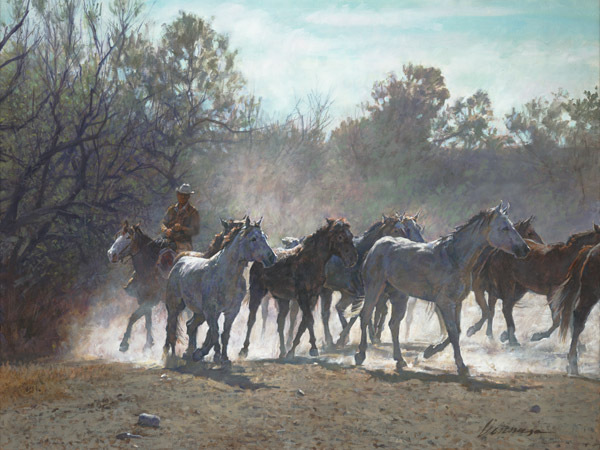 Gennusa is well known for his longhorn paintings, some of which have been special commissions for the University of Texas, and his horse images. Wild turkeys are also one of Gennusa’s favorite subjects. Working mostly on commission, the artist very much enjoys visiting ranches throughout Texas and learning about their history, which has fostered his interest in Western and Native American themes. Gennusa has established a very successful art career and strives to keep up with the demand for his work. In 1986, he was selected the Texas State Artist, and he recently received the 2005 “Texas Star Preservation Award” from the Gillespie County Historical Society.